This magnificent view of the reflection nebula around the star R Coronae Australis, which forms the nebula's heart, was taken by ESO’s La Silla Observatory in Chile. Full Story. Astunning new photo of deep space from a European telescope has revealed busystar-forming nebula awash in picturesque interstellar gas and dust. 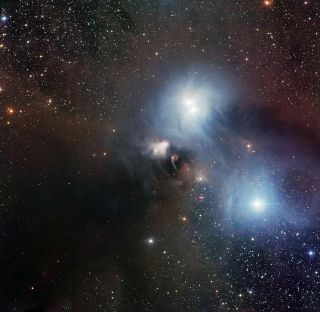 The new spacephoto shows the star R. Coronae Australis star and the vast nebula of gas anddust around it. The snapshot was taken by a telescope with the EuropeanSouthern Observatory (ESO) and is peppered with subtle colors and detailsthat give it a painting-like quality. The star andnebula are located in the tiara-shaped constellation Corona Australis (theSouthern Crown). The region is about 4 light-years across and visible to Earthas a portion of the sky roughly the size of the full moon. At 420 light-yearsaway, the area is one of the nearest and most dramatic star-formingregions, ESO officials said in a statement. The nebuladoes not shine with its own light. Instead, it is a so-called reflectionnebula, meaning that its illumination comes from the reflection of star lightand radiation off its dust and gas. The blue light, in particular, comes fromreflected starlight off interstellar dust. At thecenter of the new photo is the star R. Coronae Australis, which is one ofseveral young stars that have formed from the nebula. These stars are similarin mass to our own sun. The blackcloud trailing the bottom center and left of the image depicts a zone wherevisible light is completely absorbed by the dust and emits only heat asinfrared radiation. Only a camera capable of detecting longer wavelengths wouldbe able to make out further structures in this piece of gas. Twelvefilters of red, green and blue were used to produce this image by the WideField Imager at the ESO's La Silla Observatory in Chile.